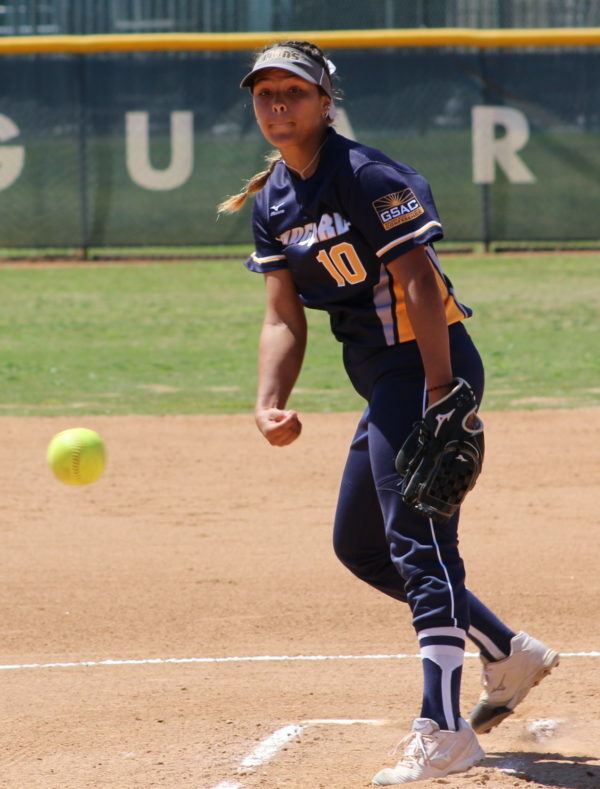 (Costa Mesa) – Former La Salle pitcher Vanessa Dwyer threw a complete game shutout as Vanguard University beat Arizona Christian 1-0 in nine innings Saturday. Dwyer, who started playing softball at Live Oak Park in Temple City, struck out four and allowed seven hits with one walk. It wasn’t exactly an easy ride. Arizona Christian had two runners on in the fifth and sixth innings but Dwyer wiggled of the hook with a groundball and a strike out. In extra innings each team starts with a runner on second base as per the conference rules and Dwyer retired the side in order in the eighth and ninth innings. Dwyer’s performance was necessary as she had to outduel Arizona Christian’s Emerald Grijalva who pitched eight scoreless innings before allowing the wining run in the ninth. For the Lions in the bottom of the ninth with Amber Huffman on second, Belle Herrera laid down a sacrifice bunt to move her to third. Karly Colenzo then came off the bench and hit a pinch hit single to right to drive in the winning run. The game was the first of a doubleheader. Vanguard also won the nightcap 5-4 with three runs in the seventh. Dwyer, a junior, improved to 17-2 on the year with an ERA of 1.87 as she leads the conference in both categories. With the sweep the Lions improved to 34-8 overall and 17-3 and in first place in the Golden State Athletic Conference.